Of course there is one in San Francisco. Actually, this is where it all started back in 1992. It happens once a month, every last Friday, so I arrived towards the end of the month of course (well, it was coincidence). This is the critical mass in San Francisco and in Frankfurt. After about an hour of cycling the mass unfortunately decided to ride right into the Golden Gate Park, where a huge music festival was taking place. It was already dark, the festival was just ending, and there was a huge 'counter mass' of cyclists riding home from the festival in opposite direction. Plus all the pedestrians leaving the festival. All these masses slowly started to merge and the critical mass was about to vanish in the confusion of different masses, despite its initially big size. On the other hand, this route was lucky: Christine, who was still in the city (Chris and Ross long gone back to nature), was at the festival to see a band playing, thus missing the beginning of the critical mass. But the very unlikely event of two people finding each other in different merging crowds of a couple of thousand people, happened. 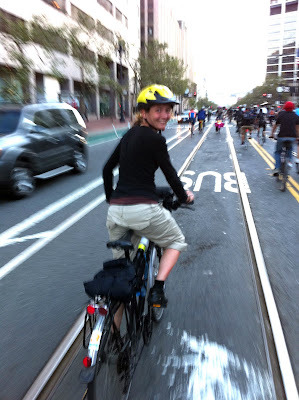 Christine joined the dying critical mass, and soon we ended up in a mini mass of around 15 people. This, too, soon split up in different directions and this was the end of the critical mass. But for the time it lived, it was fun!